January 4th – First Fridays: Get together at the Harpers Mill clubhouse on the First Friday of every month from 7pm-9pm for happy hour and fun with your neighbors! This group is for adults only so it is perfect for empty nesters, couples without children, or parents who just want some “me time” with their fellow neighbors! Join the First Fridays Group on Facebook by clicking here. January 14th – Book Club: Join the Harpers Mill Book Club at 7pm at the Clubhouse to discuss “Eleanor Oliphant is Completely Fine” by Gail Honeyman. Join the Book Club group on Facebook by clicking here. For additional info or questions, please contact Cassie Fiscus at cassiefiscus@gmail.com. January 16th – Bible Club: The Bible Club is hosted by Harpers Mill neighbors, Neil and Donna Wilder, on the 3rd Wednesday of every month. For additional info or questions, please contact Neil Wilder (917-225-3748) or Donna Wilder (917-225-4012). January 18th – Poker Night: Join the the Poker Club at the clubhouse on the 3rd Friday of every month to play Texas Holdem with your fellow poker players. Guests are welcome. Join the Poker Club group on Facebook by clicking here. 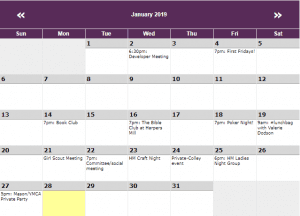 January 22nd – Social Committee Meeting: If you are interested in joining to 2019 Social Committee please plan to join this meeting or get involved by joining the Facebook Group. Join the social committee by clicking here. January 23rd – Craft Night: Hosted by your neighbor, Kate McCullough. The class is free with a suggested donation of $5 to cover the cost of materials. Kate will bring everything needed to walk away with this finished project. BYOB ❤️ Snacks and meet new friends! January 25th – HM Ladies Night Group: Calling all Harper’s Mill ladies…come and get to know the ladies in the hood! Drink some wine, nibble on some snacks, and hang out with some awesome ladies! Join the Ladies Night group on Facebook by clicking here.